Fresh presentation and admirable dedication to its big idea can't save this two-player adventure from mediocrity. Messy, varied and inadvertently hilarious: A Way Out is an unusual but uneven tandem ride. If you go into A Way Out thinking its mandatory two-player co-op is a gimmick, you'll likely come out of it realizing that it couldn't have been done any other way. Vincent and Leo's journey will have you and a friend performing tasks together both mundane and dramatic, and the result is a memorable, variety-packed cinematic adventure that feels like what Telltale's games might've evolved into if they'd leaned into game mechanics instead of phasing them out. It's highly inconsistent, but this is still one of the most daring co-op games of recent years and shows how well playing together can work for story-based games. A Way Out elevates co-op gaming in a way nothing has before, bringing players together to create one beautifully told story that everyone needs to experience. A Way Out has many faults, but a lack of heart isn't one of them. Seeing that heart translated into a cooperative play experience makes the journey worthwhile. A Way Out is a unique, enjoyable adventure that has a number of problems. It is a game full of smart moments, perfect for bringing together dedicated gamers and curious onlookers alike. Even with a cliched story at its center, A Way Out's persistent co-op elevates it to new heights for the newly married co-op adventure genre. The split-screen ebbs and flows according to what's happening with each character, enriching what would usually be a more-typical, stagnant co-op experience. While the middle of the game drags in some sections and finds itself littered with lousy, inessential combat, its first few hours and superb finale sequence are strong enough to make the whole journey worth seeing through. There's a constant mood about A Way Out that makes it seem like it's more inventive than it really is. Disregard that and you're left with a decent-enough story with some genuinely enjoyable video game moments. It's campy fun and that's perfectly fine. Just don't expect too much more. 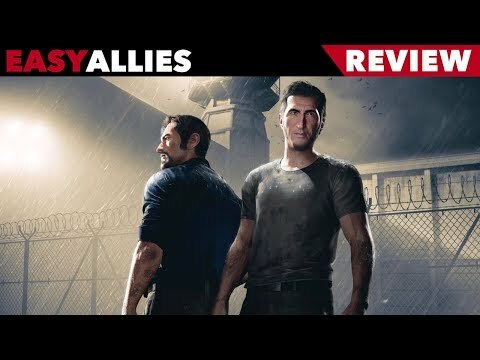 A Way Out may not be the perfect local multiplayer game, and though Hazelight made the excellent decision to allow two online players to play the game using only one copy, it lacked the replayability required to inspire me to complete it with another friend after I'd finished my first playthrough. After Brothers: A Tale of Two Sons, I came into A Way Out with expectations of a fraught and trying prison escape drama. That's just the beginning though, and it soon transforms into a fun revenge flick. It doesn't have the emotional impact of Brothers, and there's some rough edges from the breadth of ideas that Hazelight include, but most importantly we just had a lot of fun. Hazelight Studios redefines with A Way Out what a coop game should be. Leo and Vincent's story has the players facing situations like we have never seen in a videogame before. This is undoubtedly one of this year's surprises. The results of a bold idea, which stays with us until the end and offers a very clever foundation for the gameplay. It's a little too short and, sometimes, the gameplay is too basic in order for the story to advance, but A Way Out is one of those gaming experiences you NEED to try at least once. A Way Out is full of heart and soul: you'll grow to love the characters, and you'll become invested in Leo's charm and curious about Vincent's problems, but it's light and it could leave you unsatisfied. An excellent coop game that manages to entertain despite its not so great tempo due to its profound variety on almost every scene. A Way Out is a story worth sharing with a friend. There's plenty to do, with moments of intensity and emotion, and the ending is one of the best conclusions in video games. A Way Out takes some of the very best ideas from action adventure gaming and mixes them with the story telling of a great film.